Here they are, the rich lands those merchants talked about! Well, they seem to be protected, but not inaccessable for people who have nothing to lose. There is also a village nearby, we could use its resources to come up with a better castle before we conquer the best piece. Why, it is winnable. I have some saves left of the final stage where my army is standing near last enemies. 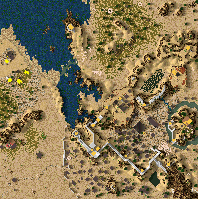 I haven't been playing this map for quite a long, so I can't give any exact instructions, but in general you should Defeat the village on the left as fast as possible to get access to its resources. Then you just build up an army and go ahead rushing your foe's castle. Do not listen to Stratego, is a nice map, Win it @ First try, But needed 90 minutes. Kosvid really Good map :) But why 100 Iron? This is tagged as an invasion map, so where are the invasions? The winning conditions of just 100 iron ingots is too easy,there needs to be a challenge to the player. There are maps here that are fun,frustrating(sometimes) and deliver the goods so to speak.